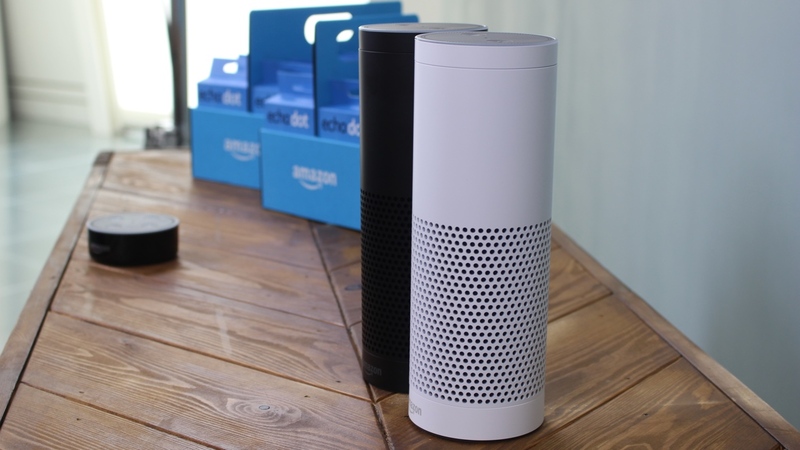 Amazon Echo is finally coming to the UK, after a wait of approximately one billion years. The device, which uses Amazon's voice assistant Alexa, is now on pre-order and will arrive UK-side on 28 September. The Echo is a small Bluetooth speaker that connects to your home Wi-Fi and essentially works as a small robot butler, keeping an ear out at all times. You can ask it questions, which it will answer by drawing info from the web, or tell it to control your smart home appliances. For example, you could ask it for the weather forecast, the football score, tell it to play music, or get it to dim the lights. The 7 microphones help Echo to pick up your voice from across the room, using what it calls "far-field voice recognition". In our review we found it worked well, but within reason. Amazon announced Alexa's arrival at a UK event, where it also confirmed it will be launching a fancy new white version of the device. The Echo is priced at £149.99, although Prime customers will get a discount of £50. Amazon's bringing Alexa's Skills Kit over too, letting developers build UK-specific apps for the device. Spotify and The Telegraph will be among over 3,000 available skills from day one. You can check out our list of the best Echo skills. Amazon also confirmed it will be bringing the Echo Dot to the UK on 20 October, costing £49.99. The Dot is a smaller version of the Echo that packs the same smarts but relies on your own speakers for sound.